Split huge files into several parts with built-in executable self-assembler. When you need to exchange data between computers, some files may appear too large to fit into the transport media or to be uploaded to the Internet. SplitIt System can split large files into smaller pieces, adding an executable self-assembler to reconstruct a copy of the original file. 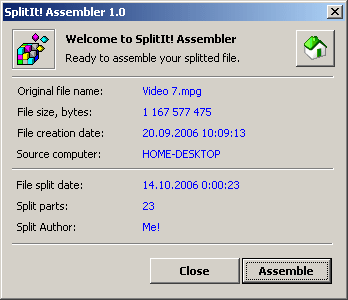 When you move all splitted parts and self-assembler to a new location, launch SplitIt Assembler and click Assemble button. That's all. Enjoy, it's free! Required disk space: Only 35K !! !